Home 1970s 1980s retro TV RIP Oh, Oh, Oh, It's Magic! The week is proving to be busy, so it's time for a perfectly irrelevant post - how many songs can I list off the top of my head that are about magic or have the word magic in the title? As The Amazing Mumford from Sesame Street would say, abracadabra a la peanut butter sandwiches, here we go! Which ones did I forget? By the way, that mythical looking cat in the photo above is magician Doug Henning, who made many a TV appearance in the 70s. With his rainbow colored costumes, long curly locks and mustache and a later interest in transcendental meditation, you could say Henning was the original hippie magician. I was surprised to recently discover that sadly, he passed away in 2000 at the age of 52 from cancer. I don't really remember a word being said about it at the time, which is why he deserves some attention on this blog. Henning was born in Canada and starting performing magic when he was only 14 years old. 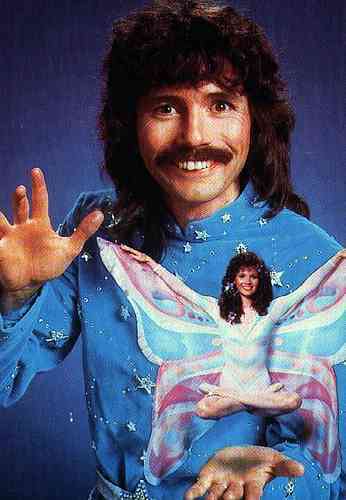 Besides appearing alongside The Muppets and on Broadway, Henning enjoyed an annual special on NBC called Doug Henning's World of Magic. It debuted in 1975 and continued for seven years, drawing millions of viewers each time. He also created stage effects through his own production company for the music industry, including videos and concerts by Michael Jackson and Earth, Wind, and Fire. He was also a bit of a crackpot. His fascination with yoga and the idea of levitation (he'd seen another magician do it on The Ed Sullivan Show when he was young) inspired him to abandon his magic career and run for political office for something called the Natural Law Party in Britain and then later in Canada. The Natural Law Party believed in "yogic flying," in which followers would hurl themselves a few inches into the air from a seated yoga position. Henning claimed that worldwide problems such as taxes, debt and disease could be cured by the exercise. Needless to say, Henning didn't secure the minimum number of votes to run for political office, and he retired from that as well, turning his attention to transcendental mediation, and even toyed with the idea of opening up a TM theme park. "Anything the mind can conceive is possible. Nothing is impossible. All you have to do is look within and you can realize your fondest dreams. I would like to wish each one of you all of life's wonders and a joyful age of enlightenment." What do you know - this post turned out to be more than irrelevant! Awww, I don't think I remember hearing about Henning's death either. How sad. I do remember him as a kid, but had no idea he had such a, well, magical life after celebrity. Sounds interesting, if a bit whacky! That song list was great! Now I have America's You Can Do Magic in my head. That is one great song! I vaguely remember him - probably from when he was with the Muppets. I do the song theme in my head too. Last time it was rain. I forget- was Puff the Magic Dragon on your list. Wow, I dig the bedazzled overalls and moon boots! Wow! I didn't know so many songs had to do with magic. That's pretty cool. Whoa...just actually watched the Johnny Carson clip for the first time (yep I included it w/o watching it first) and the old sawing a woman in half trick never fails to amaze me! Even cooler that he had Carson participate.